While flipping through the pages of (totally not-green-related) Fader Magazine the other day, I came across a little blurb on these beautiful hand-carved wooden glasses in the style section. Intrigued, I went to the website for Urban Spectacles of Wood, where I became entranced by the truly nature-inspired craftsmanship of Scott Urban, the brain and hands behind these beautiful spectacles. Urban designs and hand carves each pair of frames (or carves frames that you design) from an array of ‘eccentric and durable hardwoods,’ as well as other materials such as stone, aluminum and more. The wooden glasses are as lightweight and durable as the plastic ones most of us are used to, and the natural pores of the wood actually breathe with your skin and contour to the shape of your dome. Rogue Dead Guy Ale, an excellent choice. Is there anything out there this ninja-worthy craftsman cannot fashion into spectacles?? [Richard Paid, President] spends one in ten days a year in Brazil, and he is very sensitive to concerns about preserving its greatest natural resource. â€œOur goal is to have as little impact on the environment as possible while still producing wood products,â€ he says. To learn more about Urban Spectacles of Wood (and be entertained for hours), check its website urbanspectacles.com. If you have not seen this past Friday’s ART DAY! over at myninjaplease, you must go check it out. This week was all about the integration of art and insects (inspired by green.mnp’s own Savage Worms series, yay). Best ART DAY! to date…in my humble bug-(& art)-loving opinion. Fly on over to myninjaplease.com to see more beautifully buggy art and to learn about the artists. You can even watch a video of an insect making its own artful home! Read the full article, “Land, Farmer, Community: A Sacred Trust,” on Orion Magazine’s website. And while you’re there, don’t miss the gorgeous poem “Boundaries” by the great Mary Oliver in the same issue. The archive of past issues holds such gems as “Small Wonder” by Barbara Kingsolver (an essay reflecting on miracles, myth, and the nature of war), “The Naturalist” by Barry Lopez (discussing the importance of sitting quietly by a river), “Tumult of Vision” by David Abram (introducing the beautiful photographs of Mathew Chase-Daniel), and a lovely little essay on the humble tortilla by Rebecca Allen. The painting above is “Seed Saver” by Steven Kenny. The SOLAR TREES communicate more than lightâ€¦ they communicate the trust of placing beautifully made, complex natural forms outside for the benefit of all of society becoming a museum that if folded inside out, the museum as an incubator of change in societyâ€¦ and with this the promotion of environmental science and the joy of the new aesthetics made possible by the digital process. This is a manifesto of sorts. It proposes juxtaposing the high-tech with the low-tech, intertwining, weaving, stitching and carving the ideas and ethos of one cultural fabric onto another. A matrix created from combining and superimposing layers of cultural image. The vast canvas of landscape is the natural place to undertake this task. This project seeks to integrate multiple cultures and landscapes by layering from the outside in. 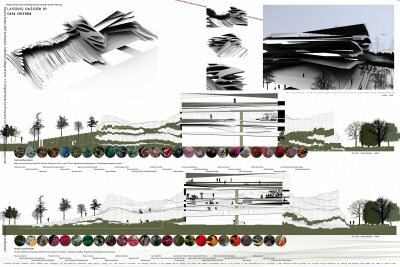 This notion of layering, outside in, is also used as the primary methodology for this thesis. It is believed that the layering is the way in which we live now. This is unconscious to most but evidence for this strengthens with each passing day. Layering as a method allows independence, letting each layer work on its own and in concert with the others. It provides a mechanism for fluctuation in programmatic and formal inventions. In both plan and elevation, the layers are evident formally as facades, superimposing on each other within the whole. Programmatically, layering occurs between the boundaries of architecture, entertainment and information. On the landscape, layers are shaped to make space more useful and to provide provocation. Check out Janine M. Benyus’ book, Biomimicry : Innovation Inspired by Nature – I just got a copy, and it’s incredibly informative and [as the title suggests] inspiring. Sounds simple, right? That life creates an environment suited for life is a fact constantly taken for granted by humankind, as we’re the only life that doesn’t follow this beautifully simple rule. Its really quite fascinating how we view ourselves, as something outside of nature – something unnatural. So what’s a ninja to do, you ask? Borrow all the best ideas from your surroundings, and adapt them to your needs : enter biomimicry. William McDonough speaks at TED on the wisdom of designing ‘Cradle to Cradle‘. Today, with our growing knowledge of the living earth, design can reflect a new spirit. In fact, when designers employ the intelligence of natural systemsâ€”the effectiveness of nutrient cycling, the abundance of the sun’s energyâ€”they can create products, industrial systems, buildings, even regional plans that allow nature and commerce to fruitfully co-exist.